Mountain Jew cuisine is well known for its delicious dishes. The unique recipes of many dishes are passed down from generation to generation. 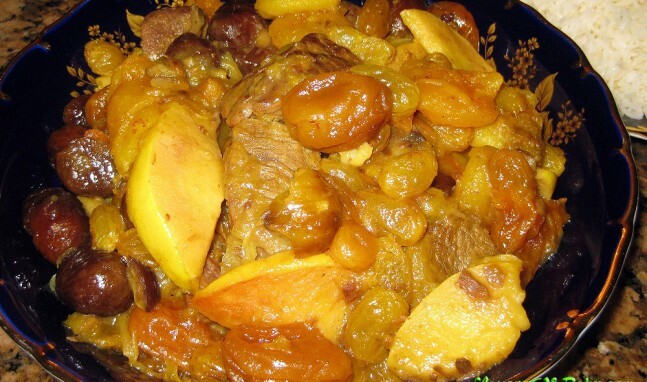 Nukhorush is one of them, it’s made of meat, dry fruits, chestnuts and quince, and served with Osh (rice). 1. 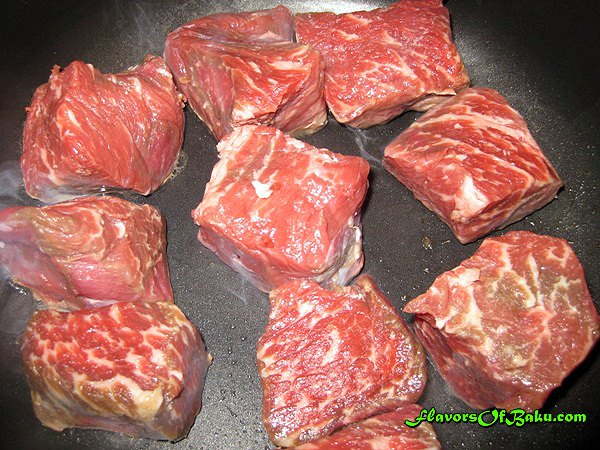 Cut the meat into pieces (approx. size of an egg), place them in a pot or saucepan. 2. Lightly fry them on all sides (don’t add any fat or oil). 3. 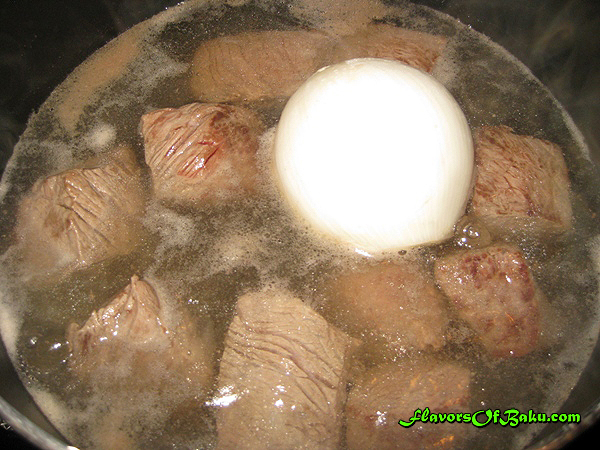 Cover meat with hot water, and as it comes to a boil, skim the foam off the top and place the onion. 4. 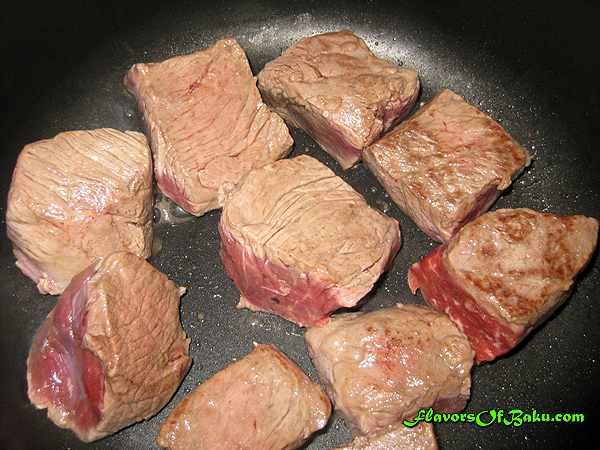 Reduce the heat to low, add salt and pepper to taste, and simmer until the meat and onion are cooked. When choosing quince, choose one that is large, firm and yellow, without any bruises. Wash it and cut into quarters, don’t peel them. Using knife remove the core with the seeds and all hard area around the core, then slice each quarter. Cook the chestnuts, or use preserved ones. 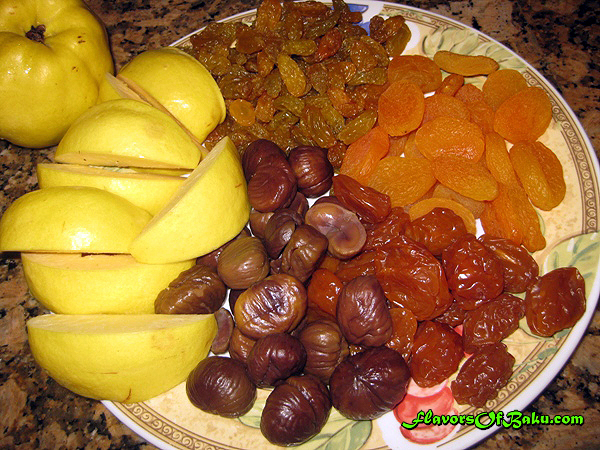 Wash and dry pat the dried fruits. 6. 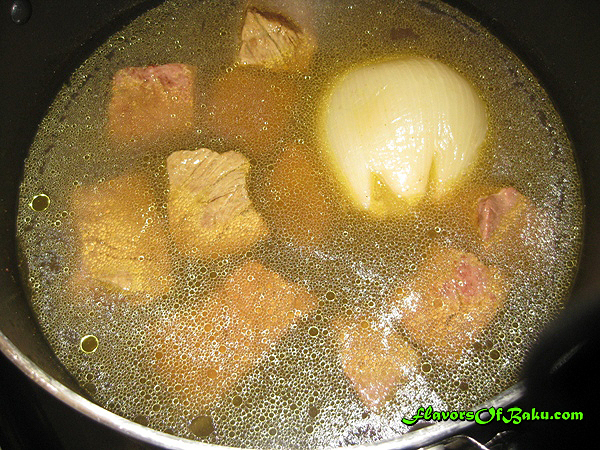 Remove the onion from the broth and mash it well. With a spoon, collect the fat from the surface of the broth and pour it into a saucepan or skillet (you can add olive oil if there is not enough fat in the broth.) 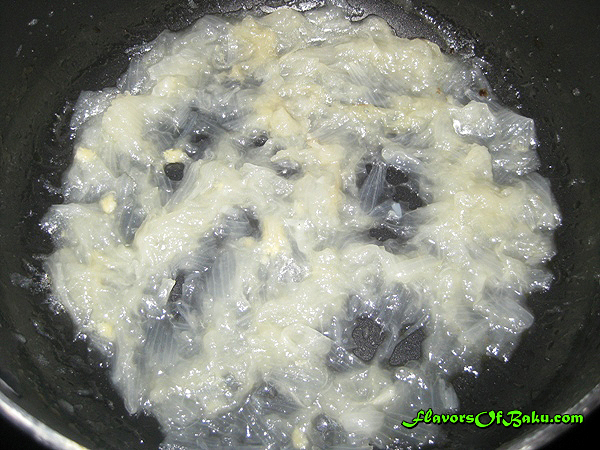 Place the mashed onion into a saucepan, and lightly fry it. 7. 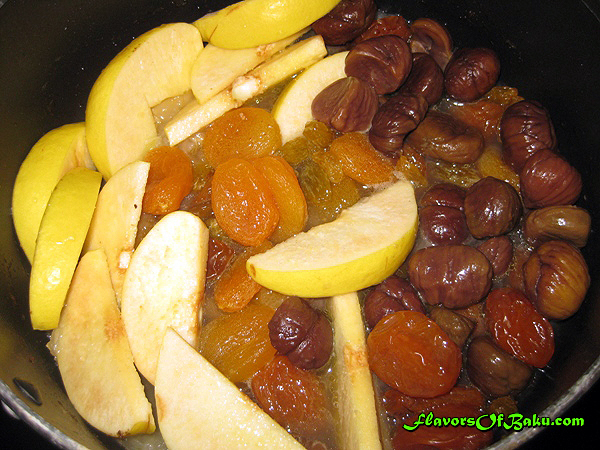 Then add cooked chestnuts, sliced quince and dried fruits to the saucepan. 8. 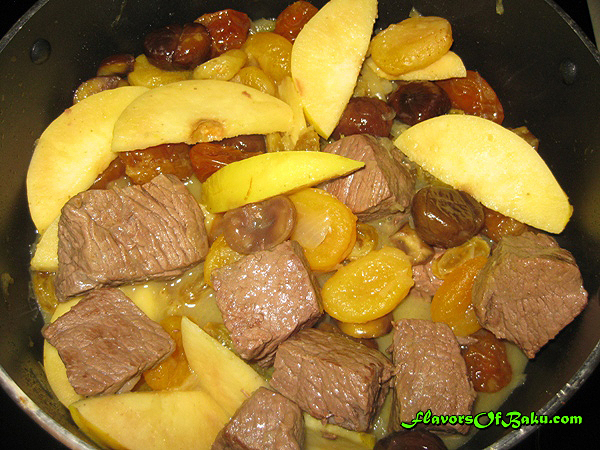 Add cooked meat to the fruits, add one cup of broth and a pinch of turmeric, and gently mix all together. 9. 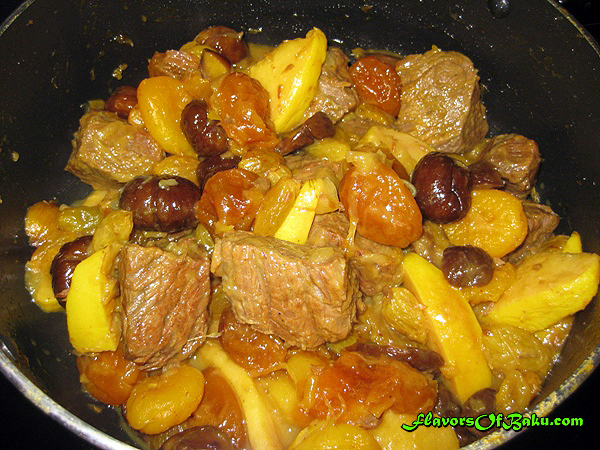 Cover the saucepan and cook over low heat, until the quince and fruits are softened. If there is not enough liquid in the Nukhorush, just add some more broth. 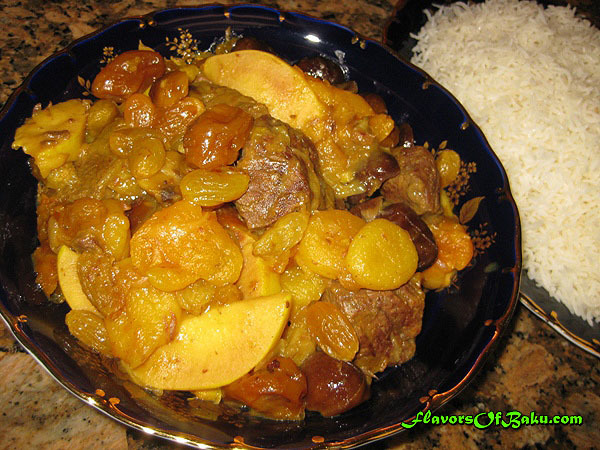 All ingredients will absorb each other aromas, to create a fantastic and unique sweet and sour taste. 10. Serve Nukhorush with Osh. 2. Fill a pot with water, add salt, and bring it to a boil. Place the rice into the boiling water. Stir, lower the heat to medium, and let it cook for 10 minutes (cooking time is depending on the quality of your rice). 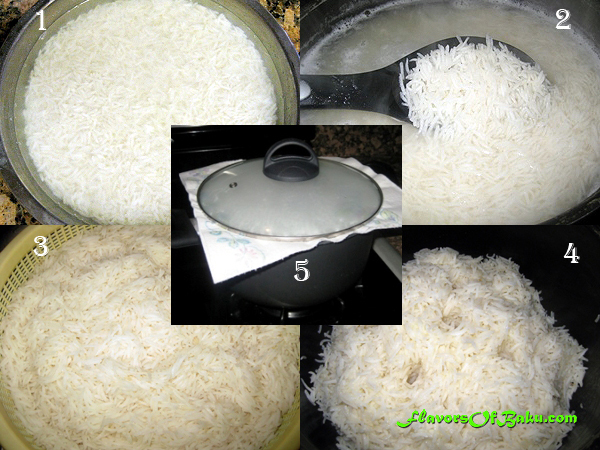 Cooked rice should be soft on the outside and hard inside, but not raw and not overcooked.